We've finally done it. We've jumped on the shiplap bandwagon that has overtaken the design world. 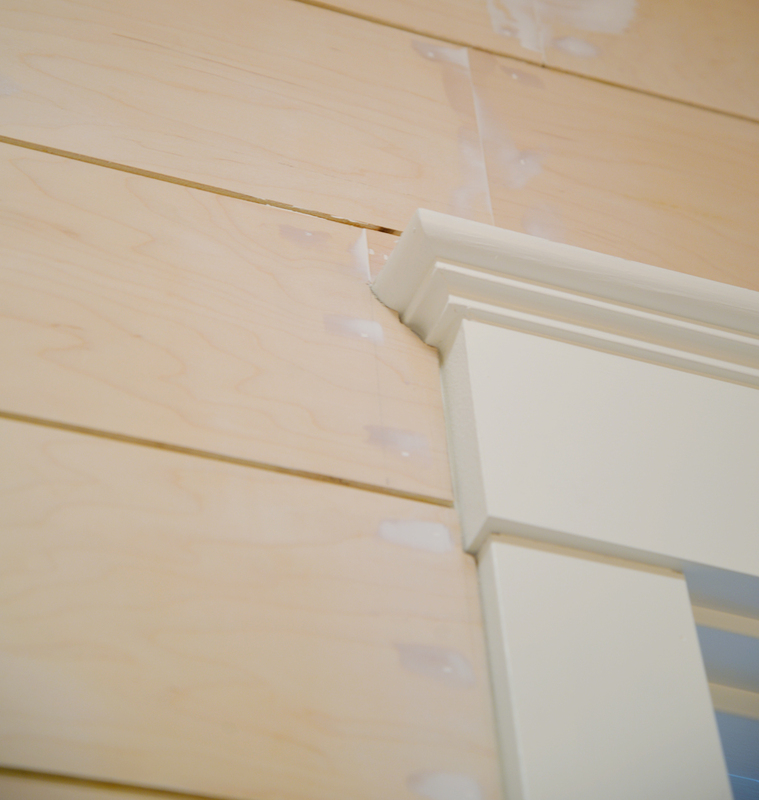 If you've been reading here a while, you'll know that we are big fans of any type of trim, moulding, or millwork. But shiplap just never felt right for our house in an urban city. Our cottage in the country though... it's just right for a shiplap wall. As with many of our projects, we like to DIY it but don't want it to look DIY. There are lots of shiplap tutorials out there (this video one is great) but I thought I'd share our approach and things we considered from an architectural and structural perspective. Thinking about these small details really can take your project from "looks ok" to "I can't believe you did that yourself!". 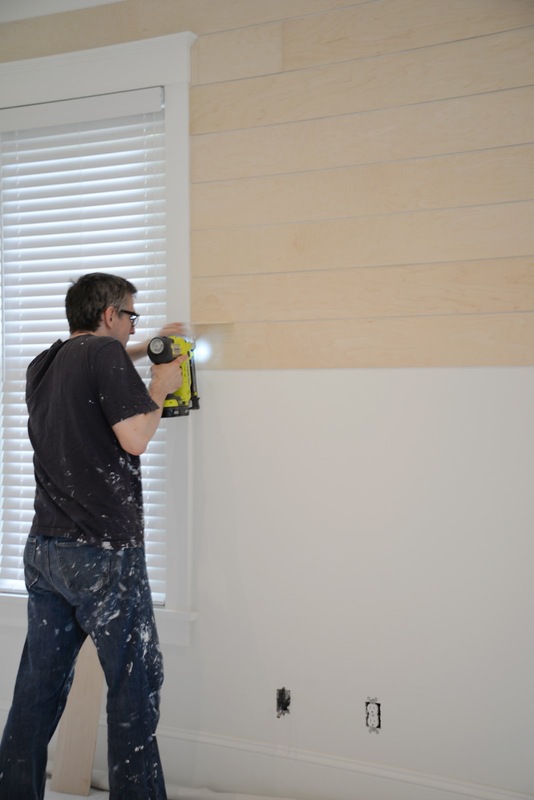 In this post we share how to install a shiplap wall, how to shiplap around doors and windows and baseboard, the cost of different shiplap materials, and important things to consider before you start your shiplap project. I was excited to partner once again with The Home Depot Canada on this project and more over the coming months. 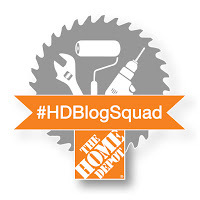 As a member of the #HDBlogSquad, I'll be providing you DIY inspiration for interior and exterior projects. 1. Different Materials, Different Looks. Different types of Shiplap. Thanks to shows like Fixer Upper, most people think of "shiplap" as planks of wood installed horizontally with a gap or space in between. 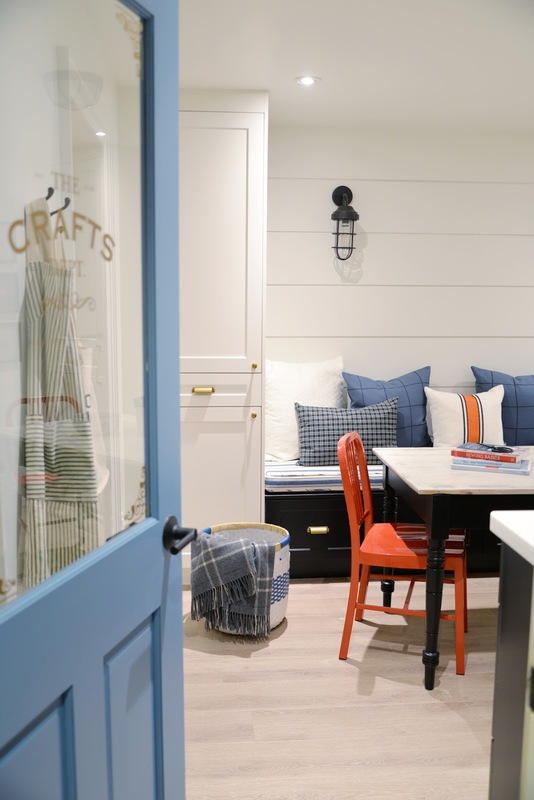 There are many different ways you can achieve this kind of look and the cost of a shiplap wall will vary based on the material you choose. 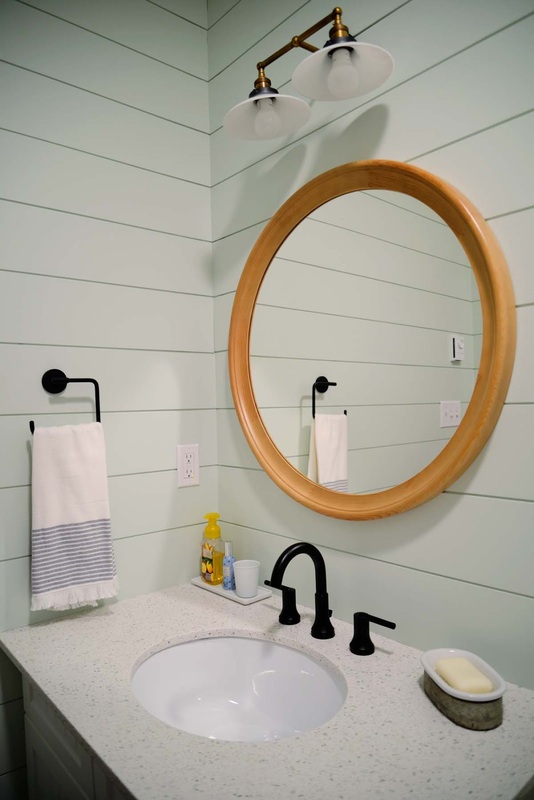 Real shiplap boards. Shiplap has a rabbet or notch on the edges of the board. When the boards are stacked horizontally, the edges overlap and self-space and create a strong, unified surface. This is the most expensive option. Here is an example of a shiplap board. Tongue and groove planks. Unlike shiplap, tongue and groove boards interlock with one edge slipping into the groove of another. The slight bevel on the edges of a board create the illusion of the gap. Using a material like this would create a plank wall similar but not identical to a shiplap wall. Plywood cut into planks. This is a plywood sheet cut into strips of wood. The planks are manually installed with a space in between. This would be the most inexpensive option. To keep the cost of our shiplap wall down and for ease of installation, we decided to go with Option C and used 1/4" Maple Purebond Plywood. It's important to keep the scale of the room in mind - you don't want your planks to be too narrow if you have a very large wall to fill. Our shiplap was going in two spaces: on a single wall in our living room, and in our main bathroom. Both spaces are of a medium size so we had the plywood cut into 6" strips at The Home Depot. - plywood is available in 1/4" depth. I'll get into why that is important in my next point. 2. Keep your baseboards, and install shiplap boards that are equal to or have a shallower depth. This way, your shiplap can rest atop your baseboards and won't stick out. 3. Use whatever shiplap you want and ignore differences in depth where the planks meet the baseboard. Now I might have gone with option 3 (Don't worry about it! Nobody looks down there anyway!) but Sean, architect that he is, was having none of that. I knew he was right. Our cottage is a new build and the baseboards are perfect and dent-free so we didn't want to remove them. Using a narrow 1/4" plywood was our best option. Again, keeping the depth of your materials in mind will take your project from one that looks DIY to one that looks professionally installed. Many people will jump right into installation, starting at the bottom, levelling the board, and working their way up from there. 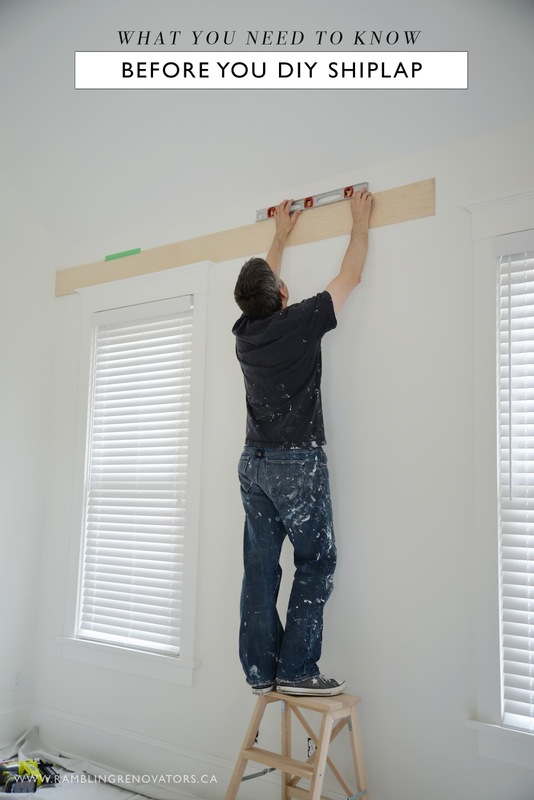 If you do this, you might be left with a sliver of a board at the top of the wall, or your boards might fall strangely around doors, windows or outlets. We always consider if there is a logical place to have a full board and start from there. As we did with the tile in our laundry room, we determined the critical board. In this situation, it made sense to have a full board running corner-to-corner along the top of the windows. Sean held the critical board in place and marked where the boards would land down the wall. To space between our boards, we just used the thickness of one of the boards, 1/4". It's not necessary to do this measurement but it will give you an indication of where your boards will fall. In our classic bathroom, this measurement exercise proved important as we found our wall tile was short a 1/4" from the floor. By knowing this before installation, we were able to rejig the tile pattern and add in a pencil tile to eliminate the gap. 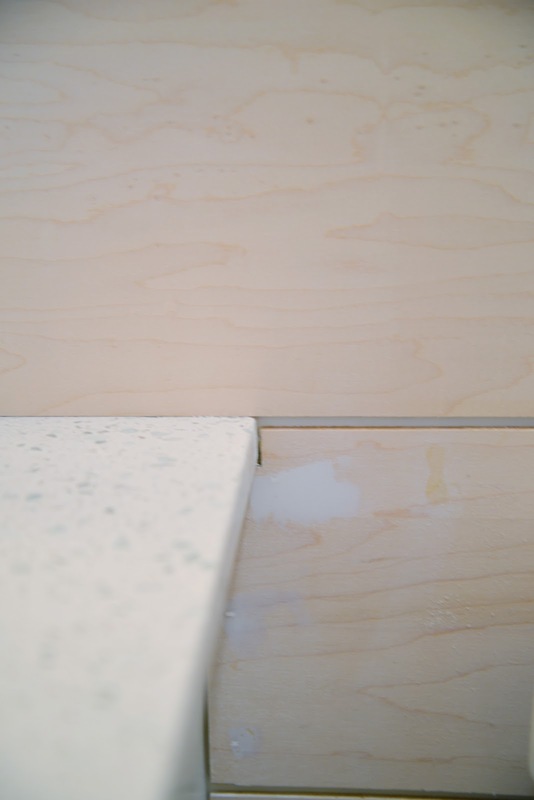 Here's another example of the critical board: in the cottage bathroom, we started with a full board flush with the countertop. 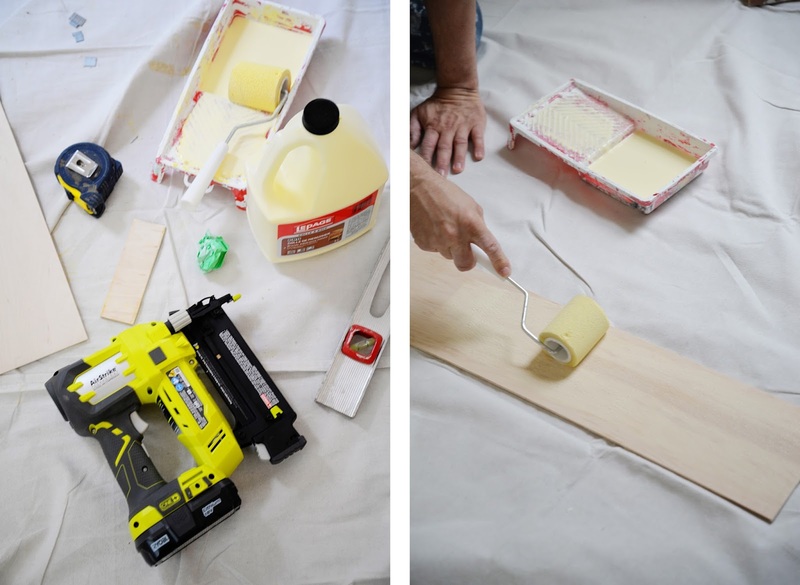 Before you install the planks, you'll want to sand down all of the cut edges. One thing you also want to consider is the use of glue or adhesive. With most tutorials I've seen, bloggers will just mark the stud line and nail the boards directly into the studs. I would think this would be strong enough to hold the planks against the wall. In our particular situation though, or cottage is three-season, meaning that it is closed up over the wintertime with no heat. As a result, the structure of our cottage is subject to significant temperature extremes (welcome to Canadian winters!) and natural woods can expand and shrink and warp as the seasons change. It's part of the reason why the builders chose to use a wood-lookalike vinyl flooring instead of natural wood floors in the cottages. That said, to ensure a stronger hold, we applied Lepage Pro Carpenter's Glue to the backs of the planks before nailing them on. 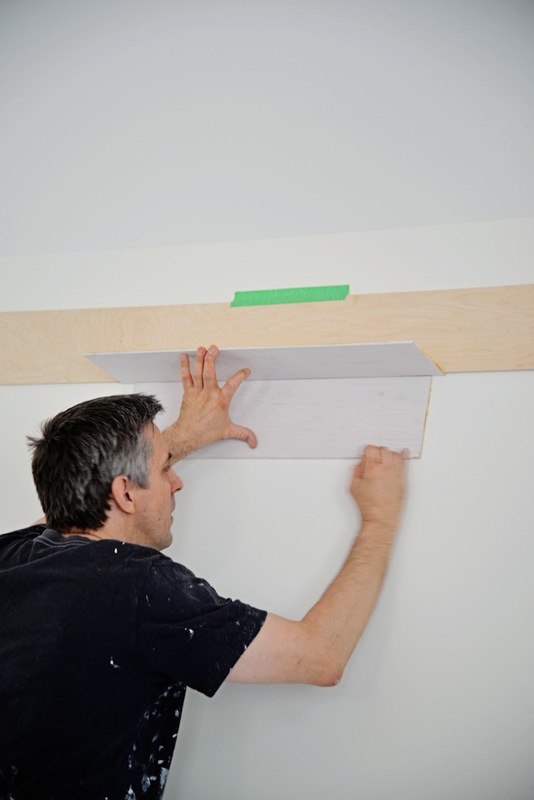 Glue can ruin your drywall so be aware it might be a challenge if you ever want to remove the planks. Installation is pretty straight forward. Start with your critical board and nail it into the studs. 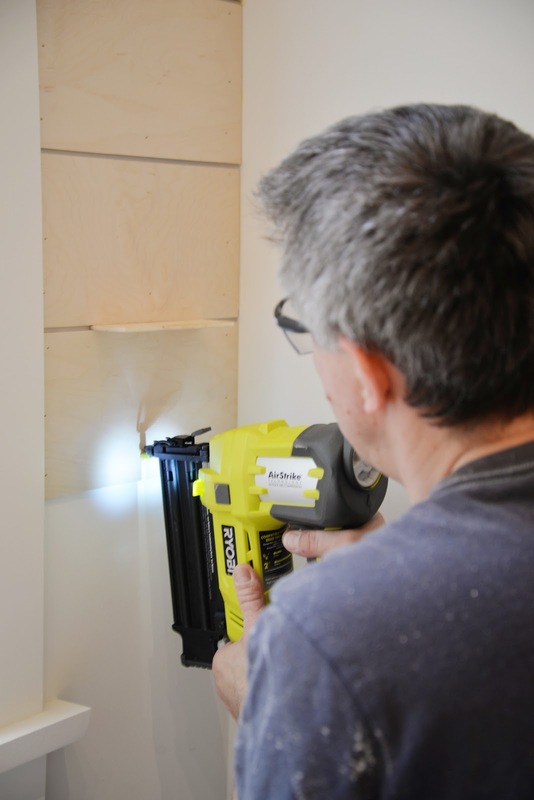 We love love loved using our RYOBI One+ 18 Gauge 2" Brad Nailer on this job. The nailer is lightweight and easy to use. Even Chloe got to nail a few boards. You can see here how Sean used a scrap piece of the plywood as a spacer. You can also use pennies or a tile spacer but this method is much easier. Just slide the plywood along horizontally, push the board beneath up tight to the spacer, and nail in. To cut around outlets, use a jigsaw. For more intricate cuts like around the cornice above, trace the pattern onto paper and then use that as a template to cut your wood. Before we put the last board up, we let Chloe right a little message on the wall. A fun little touch we do with all our projects. I'm pretty thrilled with the shiplap - it's a classic look that never goes out of style. I can't wait to show you what the rooms look like now! 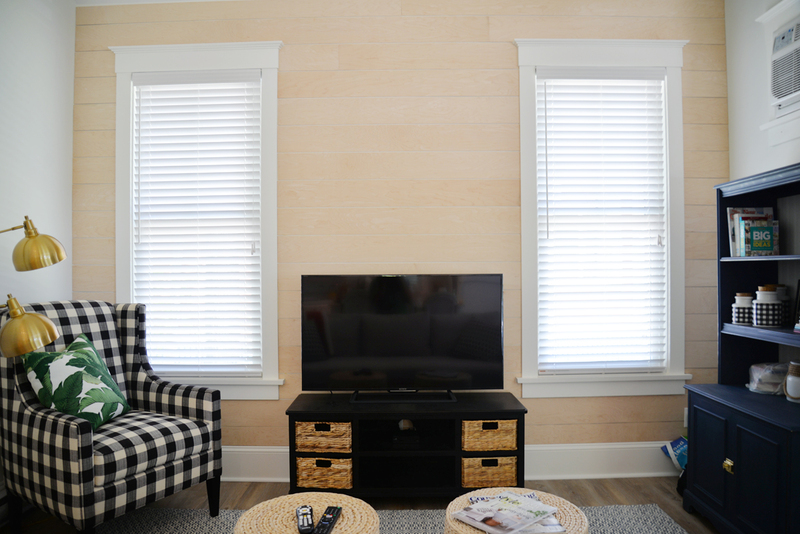 Have you installed shiplap? Any tips or tricks that you want to share?